QWhat is the Educational Qualification for PUC Candidates? What is the Educational Qualification for PUC Candidates? Candidates who are appearing class 12th exam can also apply for GCET 2018 exam and they have to submit all the required documents till the date provided by the institution if they got selected. QWhat is the domicile minimum number of years for applying ? What is the domicile minimum number of years for applying ? Candidates must have resided in the state of Goa for a minimum period of 10 years. Qplease tell when the form will be available? please tell when the form will be available? 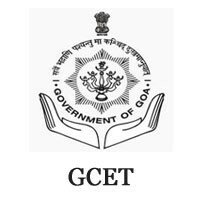 The commencement of application forms for GCET/GOA CET will be from March 2018. Qwhen will the counselling process start??? when will the counselling process start??? GCET/GOA CET 2018 Counselling will start from 1st June 2018. QDoes Goa College of Engineering provides Mining engineering course? Does Goa College of Engineering provides Mining engineering course after qualifying GCET? Yes, Goa college of engineering provides mining engineering course after candidate qualifies GCET. QI have to take admission in MBBS.Do I need to give GCET? I have to take admission in MBBS. Do I need to give GCET or any other exam? To take admission in MBBS, you need not give GCET. You will need to appear for NEET Exam. QWhat are the top 5 colleges that accept GCET score? What are the top 5 colleges that accept GCET score?